Teardrop flag printing gives you an attractive wind-resistant solution for outdoor advertising. There's a good reason you keep seeing these flags during outdoor sporting events and grand openings. Unlike regular banners, teardrop flags maintain their integrity even during windy days. This makes them perfect for outdoor advertising at the beach, ski trail, or anywhere else windy conditions are expected. Teardrop flags come in two sizes, measured from the bottom of the base to the top of the flag: 8.6' (33" x 71" flag) and 11.4' (39" x 93" flag), giving you a convenient, yet still truly eye-catching piece of ad space that you can carry anywhere. They are printed on a lightweight, yet durable polyester fabric and are each mounted on a pole attached to your choice of base. Choices for bases include ground spikes, cross bases, and water weight bags. Ground spikes are ideal for securing your custom teardrop banners on sand and grass. Cross bases are excellent for indoor promotions, such as in convention halls. Water weight bags further improve on the stability of cross bases and can be used in the outdoors on hard surfaces such as concrete, or frozen ground. Each custom teardrop flag order comes with a flag, pole, cord, pin, and ring. There's also an optional nylon travel bag for easy transport and storage. 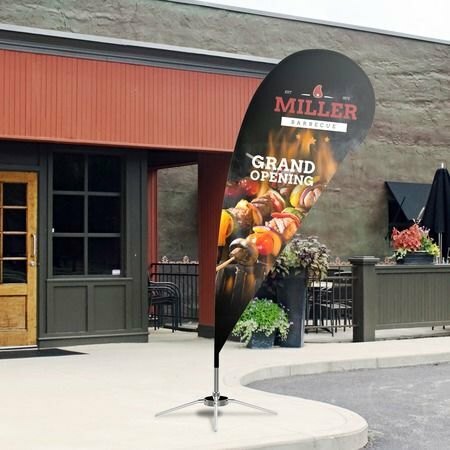 This makes teardrop flag printing a convenient all-in-one large format advertising solution that you can use virtually anywhere. Contact us to learn more about teardrop flags and other outdoor advertising tools.